September is here, but there are still quite a few free outdoor film series around town. 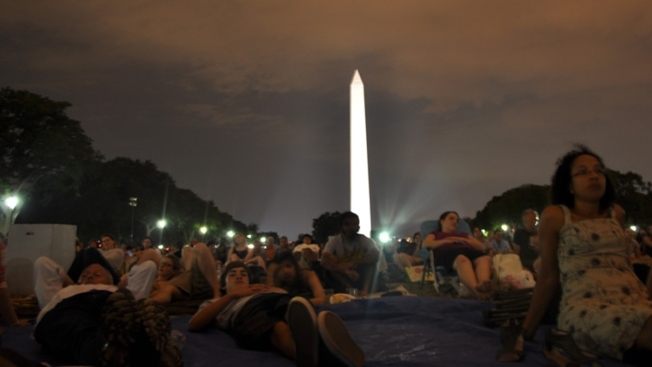 Pack up your blankets and coolers for a D.C.-area tradition. Read on for our list. Don't see your fave film series? Add it in the comments! NOTE: Film schedules are subject to change due to weather. Please check with the venue to verify dates and times before you head out. Columbia's Lakefront Summer Festival -- Every Friday, Saturday and Sunday through mid-September. Movies begin at dusk. National Harbor Movies on the Potomac -- National Harbor Plaza, 137 National Plaza, Fort Washington. Movies begin at 6 p.m.
Sept. 27: "James and the Giant Peach"
Summer Movies at the Wine Bin -- 8390 Main St., Ellicot City. Movies start at 9 p.m. in June, July and August, and at 8 p.m. in September. Sept. 5: "The Sound of Music"
Sept. 19: "Guardians of the Galaxy"
Lovettsville Movies on the Green -- Town Green within the Town Center Development, Lovettsville. All movies begin at dusk. Mosaic District: Films in the Park -- Strawberry Park, 2910 District Ave., Fairfax. Movies begin at 7 p.m.
Sept. 4: "The Lego Movie"